We noted before how Brock Lesnar was advertised for only one Raw episode before WrestleMania, though he was always expected to make more appearances. Now Pwinsider is reporting that he will be part of atleast two more episodes of the show, which should be enough to build up his match with Seth Rollins at WrestleMania. The shows he is expected to appear in include the February 25th episode from Atlanta, March 18th episode from Chicago and the April 1st episode from Washington DC. Out of these three, April 1st is the go home episode for WrestleMania 35 and February 25th will also feature Ric Flair’s 70th birthday celebration. 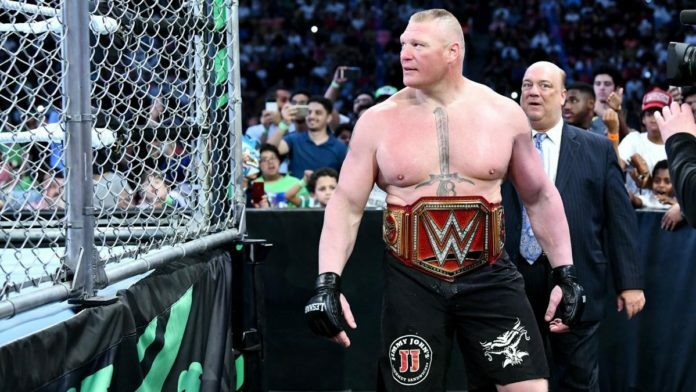 Lesnar is not expected to appear at this Sunday’s Elimination Chamber PPV and with this schedule; it’s easy to imagine that he won’t be wrestling at the Fastlane PPV either. There is no word yet on what the Officials are planning for his WrestleMania match against Seth Rollins and if he will be sticking with the company afterward. The logical choice would be for Rollins to defeat Brock but it would make sense for the company to try and keep him engaged even after that due to the decline in ratings and increasing competition.